Do you ever get the feeling that “Let’s Make A Deal” isn’t just a TV game show? Everyone’s day is filled with negotiations and give and take, with plenty of agreements that can be positive. More often than not, the process doesn’t end successfully (like trying to persuade kids to go to bed on time), but building on things that didn’t work at first can lead to a big win next time. A newer version of the television classic “Let’s Make A Deal” is a hit all over again with Wayne Brady as host, but I still prefer the original with Monte Hall and announcer Jay Stewart. And who can forget Carol Merrill pointing out all the displays so elegantly on the stage? Contestants would also have no problem dressing up in cold cuts and assorted produce long before Lady Gaga began making millions for such antics. Anything for a chance to check out those mysterious doors. Often, fabulous prizes went home with participants who chose wisely, but usually it seemed that the chosen door would reveal a treasure like a potted plant or live goat. Some viewers at home would mutter how dumb a bad choice was, or heave a sigh of relief that they weren’t on camera for such notoriety, being seen in public as a loser. Isn’t life like that? Every moment there are “doors” around us. Some close occasionally, while others open up. It’s all about how we react to what we find. 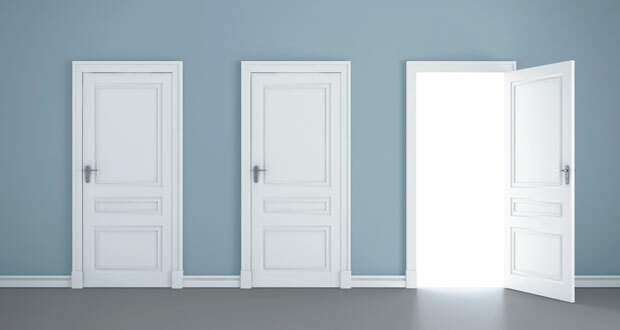 When a door closes or another opens revealing something we don’t want or anticipate, we have a choice. We can keep at it, hoping for the best… or quit. I thought about a lot about doors a few weeks ago, when I ended up experiencing an unscheduled hospital visit. I’ll spare you most of the details, but let’s just say Dr. Heimlich’s Maneuver didn’t work on me. So the chunk-of-chicken-removal-procedure had to be done by professionals, followed by a lovely three-night stay to make sure there were no complications (like “Oops, we punctured your esophagus”). As I wandered up and down the hallway, in those not-at-all-fashionable hospital gowns (feeling very humble because of that), dragging my IV tower with me, I would find myself glancing into the doorways of other rooms as I passed by. At first I felt uncomfortable. In one room there was a patient who had broken bones, but would be OK. In another, there was a 97-year-old man who had taken a fall. He was a World War II veteran, still rugged and in pretty good shape, but he would often yell out due to his onset of dementia. In other rooms there would be families huddled around a dying loved one’s bed, wondering when it was “time.” It was quite an emotional rollercoaster. After a couple of walking circuits I was struck by how much those doorways are like life. Not all doors open to what we want. And the doors that seem to open easiest can be disappointing. Then there are occasions when it feels like God has changed the locks on us (often for good reason, to keep us from going where we shouldn’t go). There are also doors that allow us to see what appears to be bleak—for the moment. Later, a return to the same place brings happiness as things have taken a turn for the better. And many times we are blessed with doors that open to opportunities beyond our wildest dreams. If we choose to take a risk and see what’s on the other side, that is. When this truth is recognized, it’s easier to face those doors yet unopened, and in all situations find something inspirational for each day. Larson is a veteran Southern California radio/television personality and media consultant. His voice is heard on KPRZ 1210AM, and his weekday talkshow airs mornings, 6-9 on KCBQ 1170AM. Learn more at www.marklarson.com.